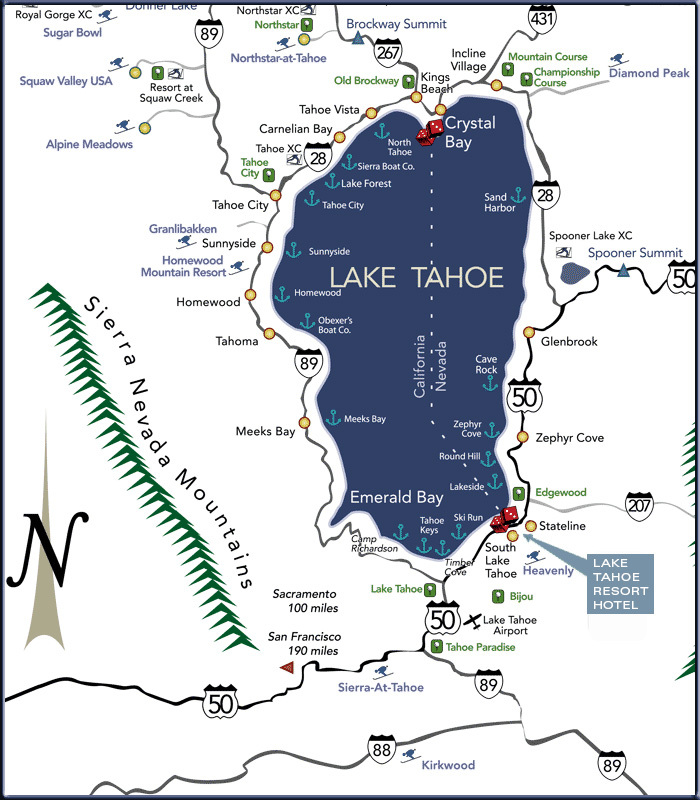 Getting to South Lake Tahoe by car is a relatively short drive from major cities in California and Nevada. The drive promises beautiful scenery along the way, and culminates with the incredible expanse of Lake Tahoe. You can fly into Reno/Tahoe International Airport to get to the Lake Tahoe Resort Hotel. With 25 flights out of Northern California and 19 out of Southern California, Reno/Tahoe International Airport has a total of 252 flights daily. Flying non-stop to Lake Tahoe from 24 destinations and direct (1 stop) from 17 destinations, getting here is easy. 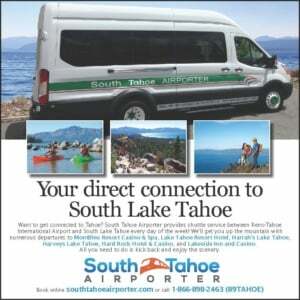 South Tahoe Airporter provides worry-free year-round transportation, with non-stop service from Reno/Tahoe International Airport to South Lake Tahoe. There are 11 regular departures daily to Lake Tahoe Resort Hotel from the departure lounge located in the Baggage Claim area at the Reno/Tahoe International Airport. 1.866.89TAHOE (1.866.898.2463). Other free shuttles will take you to the Tahoe Queen and M.S. Dixie II paddlewheelers for day and evening cruises on the Lake. In winter, the ski shuttle is an easy way to get to and from Lake Tahoe resorts. For information regarding shuttles, ask your concierge or Lake Tahoe Resort Hotel front desk staff. For sightseers and information seekers, the “Nifty 50” trolleys are an interesting option. Geared to visitor’s interests, the open trolleys operate June through Labor Day, ferrying passengers from Harvey’s to Kiva Beach on one route and from the Heavenly Tram or Zephyr Cove on another. 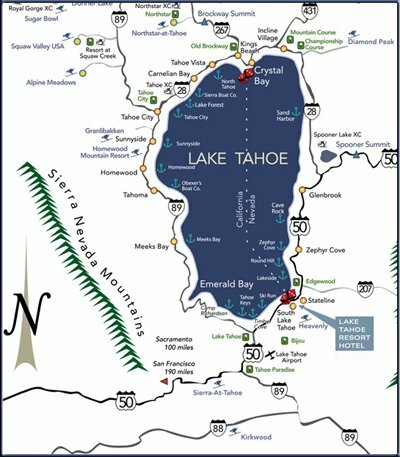 Drivers provide interpretive information and continuous narration about Lake Tahoe sites and scenes along each one-hour route.